The DataController Prevent your data connection (GPRS) to start up. It lists all GPRS connections, and allows you to disable them so that they won’t be used. The tool is especially useful when going to another country then the data connection cost a lot during the roaming. This application is based on the famous MoDaCo Nodata but with Manila touch screen interface and without nagging popups. Updated version: 1.0.1.5: Reduced application size and some GUI impruvments. 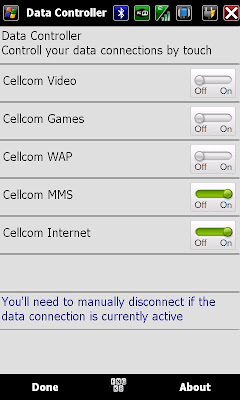 Updated version: 1.0.1.3: Option to close all open data connection from the application screen without need to do it from the Connection manager Manager. Also there are some GUI and performance improvements The application requires .Net 3.5 that you can download from Microsoft. or if you want only the cab file, search the net for the NETCFv35.wm.armv4i.cab file.